May 15, 2013 - The Federal Communications Commission (FCC) took action to expand the availability of in-flight broadband connectivity to airline passengers. The Commission proposes to establish an air-ground mobile broadband service, using a ground based network to communicate with planes, by taking advantage of technical innovations to expand sharing of certain spectrum among users. Expanded availability of in-flight Wi-Fi will help meet demand from travelers to connect to a full range of communications services while flying in the contiguous United States. More options for in-flight broadband are likely to increase competition, improve the quality of service, and lead to lower prices. Improved connectivity benefits business and leisure travelers alike in their desire for ubiquitous broadband access to keep in touch with work, family, and friends while flying. The Commission proposes to establish this air-ground mobile broadband service as a secondary allocation in the 14.0-14.5 GHz band, the same band used by satellite companies for Fixed-Satellite Service (FSS) uplinks on a primary basis and by certain Federal services on a secondary basis. The service would be required to protect primary FSS in the band from harmful interference and to coordinate with other users in the band. The Notice of Proposed Rulemaking (Notice) proposes technical rules to assure that the service’s operations will not cause harmful interference. It also seeks comment on licensing rules by which the Commission would license the service in either two 250-megahertz blocks, one 500-megahertz block, or some other spectrum block size. The Notice proposes to award these licenses by auction. FCC Chairman Julius Genachowski said “The reality is that we expect and often need to be able to get online 24/7, at home, in an office or on a plane… We take an important step to improve in-flight broadband service. .. 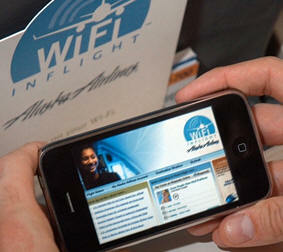 There are two types of current in-flight broadband service: satellite-based and air-to-ground. Both are licensed by the FCC. “The satellite systems, known as Earth Stations Aboard Aircraft, use satellite antennas installed on the top of planes to communicate with satellite space stations. This service, operated by multiple licensees, shares 1 GHz of spectrum among the licensees and with many other Fixed-Satellite Service operators. Air-to-ground systems deliver in-flight broadband through a ground-based network that communicates with an antenna on the bottom of a plane, which connects to an onboard Wi-Fi system providing service throughout the cabin. “The current air-ground licensee operates with just 4 MHz in the 800 MHz band. This item is focused on meeting the growing demand for in-flight broadband by freeing up spectrum for use for air-to-ground services. Of course, identifying new spectrum for new uses has been an FCC priority for the past several years. We’ve worked to free up spectrum for use with traditional auctions. We've worked to reallocate spectrum for mobile broadband from both commercial and government bands, and we've worked to share spectrum where reallocation isn't possible. “We need to continue to facilitate forward-thinking proposals like this one that help move us toward more efficient and productive use of our limited spectrum resources. Today’s Notice demonstrates how technology and innovation are enabling new solutions to meet spectrum demand, while protecting incumbent users”.